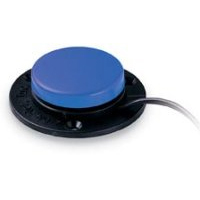 Only 2" wide and featuring a 5' cable, this circular switch can be placed on any flat surface and is easy to hit. Activated by pressing down on the top surface, the non-slip base ensures it won't move unintentionally. 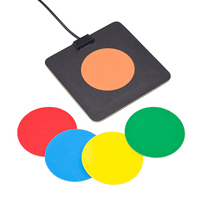 Provides both tactile and auditory feedback. This switch features a feather light touch – just 0.4 ounces or 10 grams of pressure is required to actuate! It also provides both auditory and tactile feedback to the user. The activation surface is 1.75" x 0.5", with a 7 mm travel distance before actuation. It includes 4 stickers to allow the user to use whatever high contrast color they desire (Red/Blue/Yellow/Green, or use the default grey if preferred). A wireless switch that is rugged, reliable and easy to use. Designed and built with the same hardwearing features you've come to expect from all AbleNet switches, the Jelly Beamer performs just like a traditional switch - without the hassle of cables. There's no great mystery to Jelly Beamer's wireless technology. This powerful and infinitely portable switch uses the same technology found in found in wireless headsets for mobile phones and MP3 players, and in handheld devices, such as PDAs. 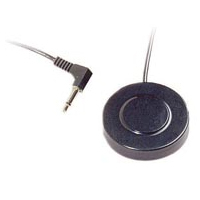 Simple to set-up, immediate hands-on results; the Jelly Beamer wireless switch has just two components: the Jelly Beamer switch that houses a transmitter, and the Jelly Beamer receiver that can be plugged into any switch-adapted device, from battery operated toys and electric appliances to a digital camera or computer. Each switch is uniquely paired with its receiver, allowing multiple individuals to use their own Jelly Beamers at the same time, from as far away as 30-feet, without interfering with one another. Let's face it, the world is going wireless, and the Jelly Beamer makes it easy to take the first step toward the wireless environment you've imagined. This highly durable switch is designed to meet the challenging requirements of wheelchair users and is waterproof and dust proof. The design allows for mounting on any flat surface and all mounting solutions are included in the price. The activation surface is 0.5" square and features a very high force (11 oz / 300 grams) which prevents accidental actuations. 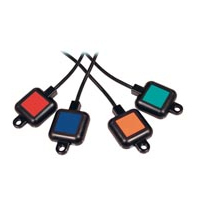 It provides both tactile and auditory feedback, and has a 4 mm travel distance before actuation. It includes 4 stickers to allow the user to use whatever high contrast color they desire (Red/Blue/Yellow/Green, or use the default grey if preferred). The Specs switch is the most versatile and durable small switch available. 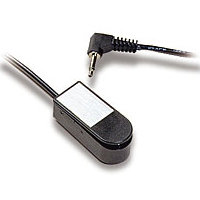 With a 1.375" (3.5 cm) activation surface, this switch is small enough to be worn, but is most often used as a mounted switch. The Specs switch includes three bases: a standard flange base, a space saving flush base and a strap base for mounting around items. 24" (61.0 cm) strap included. 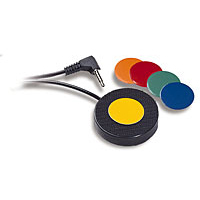 This is a very thin membrane switch (travel distance 0.05 cm) which provides no tactile or auditory feedback. It is activated with a light touch (1.8 oz / 50 grams) on the colored circle (2" diameter). The exposed surface is sealed to prevent moisture damage. Comes with 5 bright colored stickers: Red, Green, Yellow, Blue and Orange (as shown in picture). 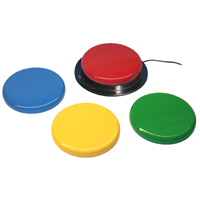 This switch features a 5.0" (12.7 cm) activation surface and is recommended for individuals who can (or prefer) to access to the largest possible target area due to visual or motor impairment concerns. It provides both tactile and auditory feedback, and due to its size requires higher than average force (5.5 oz / 156 grams) and has a 1.143 mm travel distance before actuation. 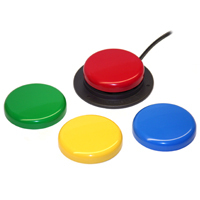 It includes 4 interchangeable switch tops which can be removed and replaced with the color of your choice: Red, Blue, Yellow, and Green. This switch is similar to the Cap Switch, but encased in a plastic cup for extra durability. It features a 1.8" activation surface with 8 mm travel distance and requires a 9 oz / 255 grams of force (above average amount) to activate. It includes 5 stickers to allow the user to use whatever high contrast color they desire (Red/Blue/Yellow/Green/Orange).